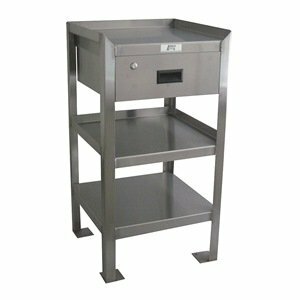 Stainless narrow work stand 1 drawer 3 shelves 18 x 18,welded frame construction. 16 gauge stainless shelves, premium polished. 16 gauge corner angles. Pre-punched floor mounting pads. Includes three shelves and one lockable drawer. If you have any questions about this product by Jamco Products, contact us by completing and submitting the form below. If you are looking for a specif part number, please include it with your message.